A world-renowned surgeon specializing in skin cancer prevention, removal and plastic surgery, Dr. Justin Piasecki is always at the forefront of innovation. Dr. Piasecki pioneered the most advanced skin cancer treatment that exists today by combining the leading skin cancer removal technique (Mohs surgery) with cosmetic reconstructive surgery. He is the only doctor in the world that is double board certified to hold and perform such procedures. Cosmetic MD's proprietary product formulations are the result of Dr. Piasecki's impressive skin and surgical experience, and all product lines aim to help prevent skin cancer development while creating a radiant and youthful appearance. 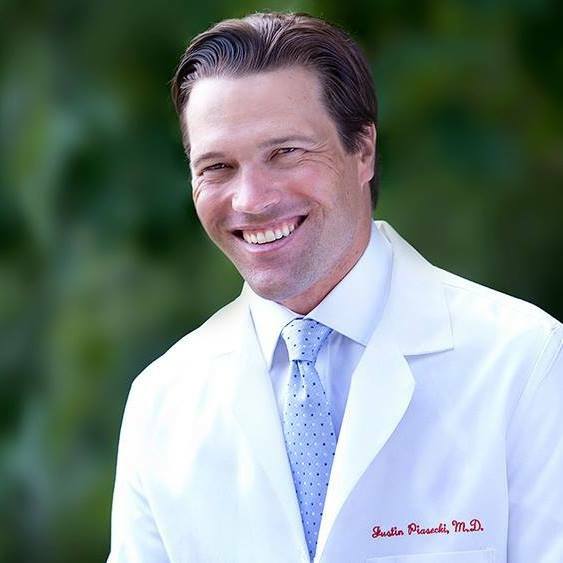 His extensive training from Stanford University and Vanderbilt Medical School (impressively in biology, organic chemistry and physiology), along with years of hard work, set Dr. Piasecki up for mastery as a physician and surgeon. Cosmetic MD products were a natural progression for him to help advance the skincare industry. What started as a personal project to benefit friend and family, along with his wife Jill, the couple unveiled the first generation of Cosmetic MD products. The history behind their process is both inspiring and interesting. Read the history behind these products. Dr. Piasecki has been featured on national television shows, Dr. Oz, The Doctors and Hallmark’s Home and Family, as well as in numerous print and on-line publications including USA Today and Oprah.com. He was voted one of“The Most Beautiful Doctors in America”. See Dr. Piasecki live in video here. An avid athlete and outdoors man, Dr. Piasecki believes that looking good starts with feeling good and doing the best you can by your body and health. At Stanford University, Dr. Piasecki competed on the swim team enduring rigorous training sessions designed for elite athletes. After graduation, he joined the US National Sprint Kayaking Team where he reached #4 in the world, winning gold medals at the Pan American Games, World Cup and the US National Championships. Today, he maintains his competitive spirit and healthy lifestyle by running to work, lifting weights, kayaking and spending time with his family outdoors in his hometown of Gig Harbor, Washington.